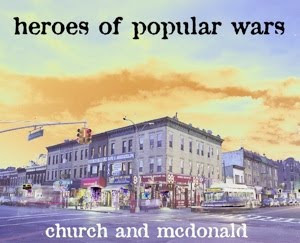 We're having trouble figuring out if this band is actually FROM Kensington or if they're just big fans of the intersection, but the band Heroes of Popular Wars released an album called Church and McDonald in August, with some awfully familiar cover art. Quasi-legendary music website Fingertips features a free, legal cut from the album. The track is called A Bus Called Further. Take a listen and tell us what you think! If you like what you heard, check out more tracks from Heroes of Popular Wars right here, and if you really like what you heard, give them money here to support this kind of pay-what-you-like model.